I have been including carrots almost daily in Nikolai's lunchbox as I need to get him to start eating them again. Lately he has not been too keen on eating raw veggies, especially carrots. At home, most of the veggies I serve for dinner are cooked except for salad and I think that is the reason it is so difficult to get him to eat them raw . Each time, when I use the Lunchbots Duo to pack lunches, I get so tempted to get their newer Lunchbots Duo which is slightly square at the sides, but there is really no good reason for me to do that. The one which we have is in perfect condition even after being used for many years. 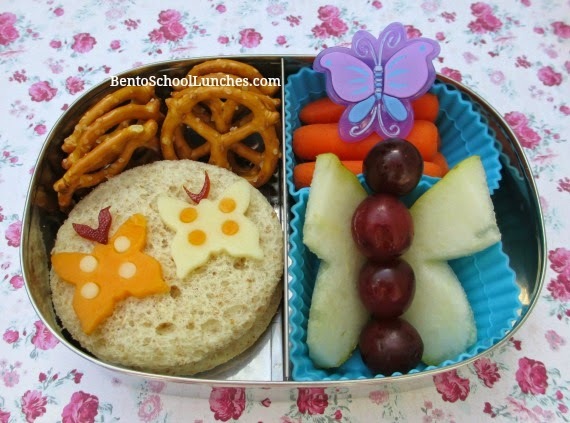 Circular sandwich with butterflies made from Colby and Mozzarella cheese (swapping the holes punched for decoration) and fruit leather for antennae. Upper right are organic baby carrots with butterfly pick. Lower right are pieces of pear with some grapes. Looks like a butterfly? So cute! Very creative way to make a butterfly with grapes and pear slices! Beautiful butterfly lunch, Rina. :) My boys hate raw veggies, they only take lettuce, took me a long time before they were willing to eat that, lol. Thank you Ming for your kind comment, and for sharing your experience with me! Very cute! I love how you used the punched holes to decorate the butterflies! Thank you Kathy for your kind comment!